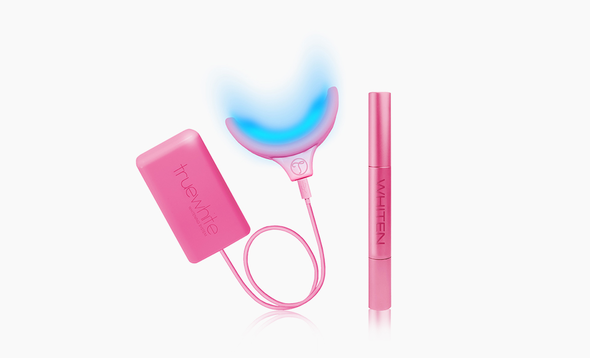 When the dental experts at True Company developed truewhite Luce Express White Plus, they knew they had created the next generation in teeth whitening treatments. Advanced LED blue light technology paired with a potent whitening gel is scientifically proven to produce superb results. Best of all, the safe and effectivetruewhite system is designed to work at home! In teal, this truewhite set eliminates the need for costly, inconvenient dental clinic visits. As easy as 1-2-3, truewhite’s cutting edge blue light technology activates a power packed gel whitening agent, effectively erasing discoloration, stains and yellowing while achieving bright shades of white for your teeth. If a brilliant smile is important to you, truewhite Luce Express White Plus is a must as part of your beauty regimen.